Uncut, November 2003, "Biting Tongues"
Re-release of albums by legendary 80’s Factory band featuring 808 State's Graham Massey. 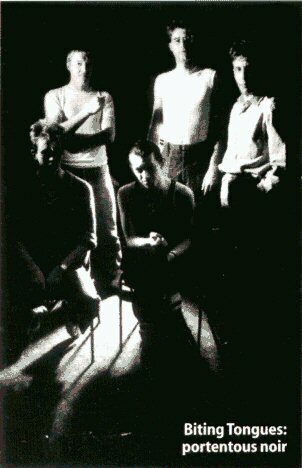 Critically overshadowed by groups like Cabaret Voltaire and 23 Skidoo in the 80’s, Biting Tongues were one of those groups crudely labeled "industrial", who were sampling before the machines were available and the phrase coined, bristly purveyors of Burroughs-influenced funk noir, turning the supposed hedonism of dance music inside out. Graham Massey's multi instrumentalism and Ken Hollings' conceptual sense drove the band. By the mid-'80s and Compressed, their moment had passed and 1988's Recharge feels like a prototype for 808 State. For a true sense of what they were about, After The Click is indispensable, with the excellent, exhaustive sleevenotes we've come to expect from the LTM label.